One day after obtaining versatile forward Kris Versteeg in a five-player trade with the defending Stanley Cup champion Chicago Blackhawks, Toronto Maple Leafs General Manager Brian Burke was right back at it on the opening day of free agency. Burke continued his upgrade along the forward line on Thursday when he agreed to terms with another versatile performer, Colby Armstrong, to a multi-year contract. Toronto Maple Leafs General Manager Brian Burke informed the media that while offers keep coming in for highly-touted defenseman Tomas Kaberle, nothing has aroused his interest. Kaberle becomes an unrestricted free agent at the conclusion of the 2010-11 season. Burke admitted that four teams made offers for Kaberle and a fifth club entered the mix on Wednesday. With such high-profile defenders such as Paul Martin, Sergei Gonchar, Dan Hamhuis and Anton Volchenkov changing allegiances on Thursday, Burke believes Kaberle's stock has risen. "I would have to guess it has increased," he said. "It has not reflected itself in any improved offers, but we wouldn't anticipate that. That'll materialize next week. Keep in mind, this is not a player we're shopping, we're listening. "We had four offers on him and a fifth team jumped in but it didn't make sense to do anything (Wednesday) night," he continued. "My guess would be that since so many defensemen moved, that Tomas' value has gone up and we'll continue to listen. If the net result of this process is that Tomas Kaberle remains a Toronto Maple Leaf, that's a result we'll be very happy with." "We acquired Versteeg with an eye on him playing along the wall (wing)," Burke told the media during a conference call. "We'll experiment in training camp where the best fit is. I don't see him playing center unless we get banged up. He brings an ability to play either wing and he's got good pace to his game -- I like a good pace. He wasn't playing top-six minutes in Chicago, he will with us and his numbers could go up." After buoying the team's defense last season with the acquisitions of defensemen Mike Komisarek, Dion Phaneuf and Francois Beauchemin and goalie Jean-Sebastien Giguere, Burke has undoubtedly targeted goal scorers the last two days. After finishing among the top 11 in scoring the last four seasons, the Leafs stumbled to 25th in the League in 2009-10 with a 2.56 goals-per game average. It was an area Burke was and still is determined to improve. "We're not done," Burke said. "What we tried to do going into the draft and July 1 was to see if we could upgrade our top six (forwards). I think we've done that with Kris Versteeg. He might not have been a top-six forward with Chicago, which won the Cup and was deep, but we think he's top six with us so that's an upgrade. "Colby Armstrong is a third-line guy but can go up and play in key situations when someone gets hurt," he continued. "I'll have a better idea, closer to training camp, how our forwards look because we'll continue to look for upgrades." The club's one major scoring threat last season was Phil Kessel, whose 30 goals were 14 better than the next highest scorer, Nikolai Kulemin. The 27-year-old Armstrong spent the last two-and-a-half seasons with the Atlanta Thrashers, notching 15 goals and 14 assists in 79 games during the 2009-10 campaign. A native of Lloydminster, Saskatchewan, Armstrong expressed excitement at coming to the Leafs in a conference call Thursday night. "It's absolutely wild," he said. "Going into today there were a lot of unknowns. I didn't really think of expecting anything. I never thought I'd be playing back in Canada. Playing with the Maple Leafs is huge. My phone's been ringing off the hook. "It's like a playoff game all the time with the crowd there. Just the atmosphere -- they love their hockey, it's obvious. Everyone around the League knows it's one of the best places to play and anyone who has a chance to go there would take it." Armstrong was originally selected by the Pittsburgh Penguins in the first round, No. 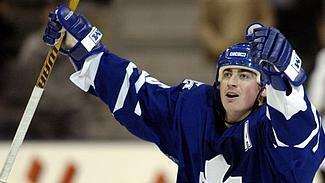 21, in the 2001 NHL Entry Draft. "Colby plays in different situations and is excited about joining us," Burke said. "We're excited about what took place the last 24 hours and we think we're a better hockey club. We did not move on some of the big names. We kept our finger on the pulse and kept abreast of negotiations and decided that we're going to wait." Burke also signed forward Joey Crabb to a two-way deal on Thursday. The additions of Versteeg and Armstrong should, according to Burke, upgrade the team's sagging specialty teams as well. The Leafs were last in the League on the man advantage at 14.0 percent and 30th on the penalty-kill at a 74.6 efficiency in 2009-10. "Special teams were kind of our Achilles' heel last season," Burke said. "You go back and look at performance, on the power play and penalty-kill … we had short spurts, but I think these are guys who played in those situations and who give our coach a better arsenal on the ice in those situations. It's certainly something we talked about leading into these transactions." On Wednesday, Burke acquired Versteeg and the rights to 21-year-old left wing Bill Sweatt from the Hawks but was forced to part ways with budding prospects Viktor Stalberg, Chris DiDomenico and Philippe Paradis. "We gave up a fair price and (Chicago GM) Stan Bowman drove a hard bargain, but we think (Versteeg) is a player who makes us better immediately," Burke said. Versteeg had 20 goals and 24 assists in 79 regular-season games last season and produced 6 goals and 14 points in 22 playoff games. Sweatt, 21, was Chicago’s second choice in the 2007 Entry Draft. The native of Elburn, Illinois has completed four seasons at Colorado College. In 143 college games, he scored 46 goals and added 63 assists for 109 points. Burke was very pleased with the upgrades made at forward. "We set our prices and if we can get the guys at our prices, we will," Burke said. "If we don't, we move on. In a cap system, you add up all your assets. To not do anything (Thursday) with a couple of the bigger names, that means, 'Ok, you didn't add a player, but tomorrow you wake up and still have cash and cap room.' To me, that doesn't mean we can't continue to improve our team between now and the end of the summer."